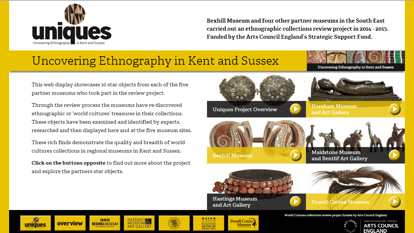 Uncovering Ethnography In Kent & Sussex (Uniques) was funded by Arts Council England involving partner museums; Powell Cotton Museum at Quex Park, Maidstone, Bexhill, Hastings, Horsham Museums, with support from Brighton and Hove Museums World Art Department and University of Kent Department of Anthropology. The project aimed to highlight strengths in the collections, research pieces that partner museum staff want to know more about, arrange professional conservation and photography, put on displays, produce a website and undertake activities involving local communities. The project has been managed by Rachel Heminway-Hurst, with community activities developed by museum learning officer Sam Smith. An initial collections review was conducted by Len Pole, the ethnographic specialist, who spent three days at each museum examining 100-200 objects, picking out star items (chosen using the significance criteria developed by the Australian Heritage Collections Council) and producing reports for each museum. Star items include; a beaded blanket from an Mfengu group, eastern Cape, South Africa, in Bexhill; an 18th century sword (talwar) with gold inlay from North India, in Horsham; a helmet mask, decorated with abrus seeds, from northern Nigeria, in Maidstone; an Ifa divination bowl, from a Yoruba group in south-west Nigeria, in Hastings; and a range of wood and fibre doll-figures from Kwanyama and other groups in southern Angola. Further detail on specified objects was provided through input from relevant specialists, operating through contact with MEG. Collectors highlighted included Cecil Blackburne, author of ‘From Oriental to Occidental Africa’ (1913), Major Newnham, Walter Pitt, and Olive MacLeod, all at Maidstone; the Powell-Cotton sisters, Diana and Antoinette, at Quex Park; the Henderson family in Horsham; the Brassey family in Hastings and Bexhill, also Brandford-Griffith in Hastings and the geologist Hans Heetveld in Bexhill. Case Studies were undertaken on several of these collectors and items. Some items still require further work, such as a barkcloth skirt in Bexhill, said to have been collected from Vanuatu, but so far no other similar examples of this form have come to light. Displays have been or are about to be mounted at each museum, focusing on a selection of the pieces and collectors investigated, or in the case of the Powell-Cotton Museum, as part of a developing permanent gallery. Community activities included, at Bexhill, using African beaded jewellery to encourage local parents with young families to talk about their family heirlooms; at Hastings, using jewellery from southern Africa in practical activities making and using beadwork; at Horsham, using the Henderson photo albums as starting points for work by photography students with th collection; at Maidstone, sessions with local people with visual impairments; at Powell Cotton, developing activity sheets from information supplied by a group of grandparents and their grandchildren, that would help them in looking at kinds of personal adornment used in Angola in the new displays. Screenshot of the 'Uniques' website. Another major outcome is the specially designed website. More general benefits from this project include providing non-specialist museum staff with greater confidence in using ethnographic material on a regular basis in their museums’ activities, establishment of contacts between museums in the south-east and nationally, through the agency of Museum Development Officers, Sussex and Kent Museums Groups, as well as MEG. Longer-term legacies will hopefully include development of contacts between these partner museums and relevant source communities, for instance the Powell Cotton Museum and Kwanyama groups in Angola and Namibia. This very brief, indicative report provides only an outline sketch of the record being compiled by Philip Jones of the nature and content of the ethnographic collections assembled by W.B. Spencer and F.J. Gillen during their influential decade-long partnership, centred on their major fieldwork among the Aboriginal groups encountered in Central and Northern Australia. From this initial research it is evident that a ‘distributed collection’ outside Australia can be identified, comprising upwards of 1,000 artefacts collected and documented by Spencer and Gillen in partnership. At least another 300 artefacts were collected by Spencer, mostly in Arnhem Land, through his fieldwork following Gillen’s death in 1912. Most Spencer and Gillen objects in British museums, and in other museums outside Australia, were obtained by Spencer and Gillen during their 1901-1902 Ethnological Expedition across Australia from Oodnadatta to Borroloola on the Gulf of Carpentaria. There are few objects in Britain from Spencer’s later solo expeditions to the Northern Territory, although such material is well represented in the European museums mentioned below. Material from Spencer and Gillen’s collaborative work during the 1896 Engwura series of ceremonies at Alice Springs, and from their 1903 expedition to Peake Station in South Australia yielded some material now held in the Adelaide and Melbourne museums. Gillen’s primary collection is in Adelaide at the South Australian Museum and this also includes ethnographic objects collected by Gillen (independently of Spencer) during the 1890s and earlier. Spencer’s primary collection is in Museum Victoria. It is clear that Spencer and Gillen intended to gather a significant collection during the 1901-1902 expedition, and that they carried a large supply of trade goods enabling these acquisitions. They arranged to send large consignments south by camel transport from their depots along the Overland Telegraph Line as the expedition proceeded. Spencer made separate exchanges with at least eleven museums outside Australia. 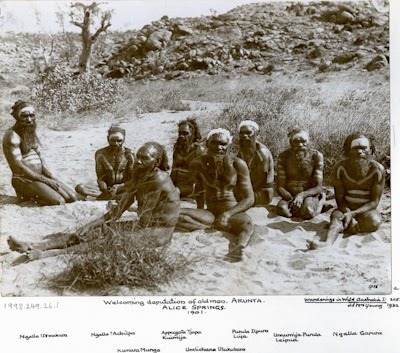 He assembled a series of essentially similar collections, comprising a core of object types from the main collecting stations on the 1901-1902 Spencer and Gillen Expedition – Alice Springs (Arrernte), Barrow Creek (Kaytej), Tennant Creek (Warumunga) and northern groups, and supplemented with additional , representative ethnographic objects from other Australian localities (drawn from the National Museum of Victoria collection), and with Victorian and New South Wales stone tools. In his St Petersburg exchange (1908) Spencer also added Melanesian objects from the Solomon Islands. British Museum: Ca.100 Spencer & Gillen objects from all the language groups encountered on the 1901-1902 expedition, viz. : Arrernte, Kaytej, Warumungu, Umbaia, Anula, Binbinga, Mara. Pitt Rivers Museum: Ca. 78 Spencer & Gillen objects, from all the language groups encountered on the expedition. University of Manchester Anthropology Museum: Ca. 61 objects, mostly from the 1901-1902 expedition. University Museum, Zurich: Ca. 155 objects (ca. 70 collected by Spencer & Gillen, ca. 30 collected by Spencer in Arnhem Land, remainder from Museum Victoria collection) + ca.90 stone tools. World Cultures Museum, Geneva: Ca. 45 objects (ca.8 collected by Spencer & Gillen, ca. 20 collected by Spencer, remainder from Museum Victoria collection) + ca. 90 stone tools. Pigorini Museum, Rome: Ca. 76 objects (ca. 40 collected by Spencer & Gillen, ca. 20 collected by Spencer, remainder from Museum Victoria collection). Peter the Great Museum, St Petersburg: Ca.160 objects (112 Australian objects, 48 Solomon Islands objects; ca. 60 collected by Spencer & Gillen, ca. 20 collected by Spencer, ca. 30 from Museum Victoria collection). Field Museum, Chicago: Ca. 300 objects (ca. 200 collected by Spencer & Gillen, ca.50 collected by Spencer, ca. 50 from Museum Victoria collection). Unexamined Spencer & Gillen collections: In New York, Genoa, Florence & Vienna. Collections in the American Museum of Natural History (New York), Genoa and Florence were prepared and sent by W.B. Spencer. It is unclear how Spencer & Gillen material arrived in Vienna. I have not quantified the Spencer and Gillen collections in Australian Museums for the purposes of this brief report. The bulk of Gillen’s collection is in the South Australian Museum in Adelaide, just as the bulk of Spencer’s collection is in the Museum Victoria collection. Spencer and Gillen material is also held in the Australian Museum in Sydney and in the Tasmanian Museum in Hobart. 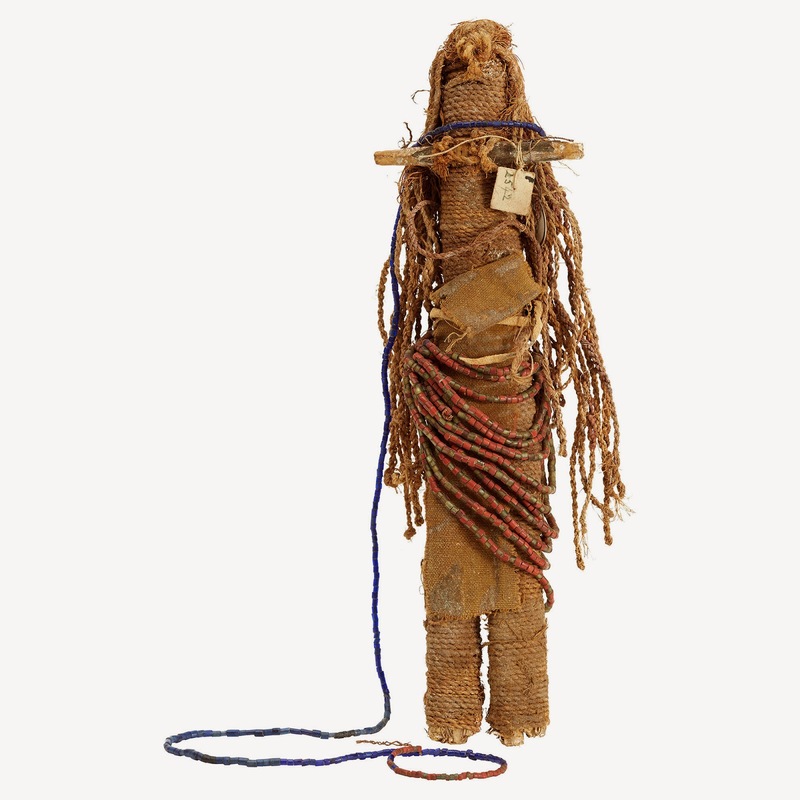 Some secret-sacred objects have been repatriated to Central Australian Aboriginal communities, and some of these objects are held in trust by the Strehlow Research Foundation in Alice Springs. Finally, there are small numbers of Spencer and Gillen objects in a number of other museums, throughout Europe and North America, mostly stemming from a series of secondary exchanges. It would be great to receive data from museums holding such materials, as the aim is eventually to reconstitute and analyse the entire extant ‘distributed collection’. One of the project’s key aims is to more closely link the Spencer and Gillen objects (particularly those obtained during the 1901-1902 expedition) with particular fieldwork stations, dates and people, and to begin a closer analysis of the objects themselves. It is already clear from an initial examination of the objects that Aboriginal people were not only exchanging objects which had been in frequent daily use, but were also manufacturing objects directly for sale to Spencer and Gillen. Certain objects are also identifiable in Spencer and Gillen’s publications, and can also be located in the numerous photographs taken by them. My doctoral research on museums and their work with diaspora communities recently involved me interviewing museum staff in the San Francisco Bay Area. I was especially struck by the activities of Oakland Museum of California (OMCA) in this respect and wanted to take the chance to update MEG members on OMCA’s forthcoming exhibition, Pacific Worlds (30 May 2015 - 3 January 2016). OMCA is the result of the mid-1960s merger of three civic institutions – the Oakland Public Museum, the Oakland Art Gallery and the Snow Museum of Natural History. At the point of merger the divergent aims and collections of these organisations were refined to an emphasis on telling the story of California. The strong sense of public purpose and interest in innovative practice shared by the three organisations, however, would continue to inform the development of OMCA and is much in evidence today. At the time of the merger some of the inherited collections seemed to speak more clearly to the new mission than others. The Oceanic collection – encompassing some 3,000 objects many of which were collected by Oakland dentist John Rabe who travelled the Pacific in the 1880s and 1890s – initially seemed anomalous and thus, as one of several ‘legacy’ collections, had not been on display since 1965. More recently an increasing awareness of the Bay Area’s long-established but largely overlooked Pacific Islander communities and the chance to mark this year’s 100th anniversary of the 1915 Panama-Pacific International Exposition (PPIE) held in San Francisco led to a review of OMCA’s Oceanic holdings and to the development of the Pacific Worlds exhibition. The exhibition aims to highlight the presence of California’s Pacific Islander ‘neighbours’ – the nearly 300,000 Pacific Islanders who live within in the state as well as those on the other side of the Pacific Ocean – and to turn ‘the familiar idea of California as the western frontier on its head and re-position the State as “the East Coast of the Pacific”’ (OMCA press release, 6 November 2014). The exhibition development process was informed by a community advisory task force of individuals well-connected within their Pacific Islander communities. The task force helped shape the focus and structure of the exhibition so as to reflect community concerns including a desire to connect objects to family stories and a commitment to the re-invigoration of historic cultural practices. Within the exhibition personal narratives will be brought to the fore through a series of large-scale photographic portraits of Pacific Islanders and films of cultural practitioners, and cultural dynamism reflected through commissions, including of tapa, a traditional Tongan outfit and a Hawaiian featherwork standard (kāhili). Pacific Worlds demonstrates much that is to be admired about OMCA not least its commitment to using its historical collections as the basis for generating new knowledge through dialogue with diaspora communities, a commitment reflected in the organisation’s policy, structure and practice and in its curators’ genuine pursuit of collaborative scholarship. My thanks to OMCA staff – Louise Pubols (Senior Curator of History), Suzanne Fischer (Associate Curator, Contemporary History and Trends) and Christine Lashaw (Experience Developer) – for the time they spent with me. Thanks also to the Santander University of Brighton Travel Grants Scheme and to the University of Brighton Centre for Research & Development College Research Student Fund for making my visit possible. Helen Mears, Keeper of World Art, Royal Pavilion & Museums, Brighton & Hove, April 2015. 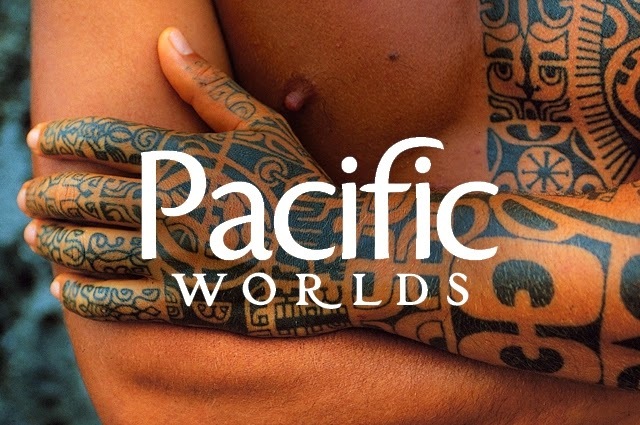 Pacific Worlds will be on display at The Oakland Museum of California, 1000 Oak Street, Oakland, California, US, 30 May 2015 - 3 January 2016. See museumca.org for further details.